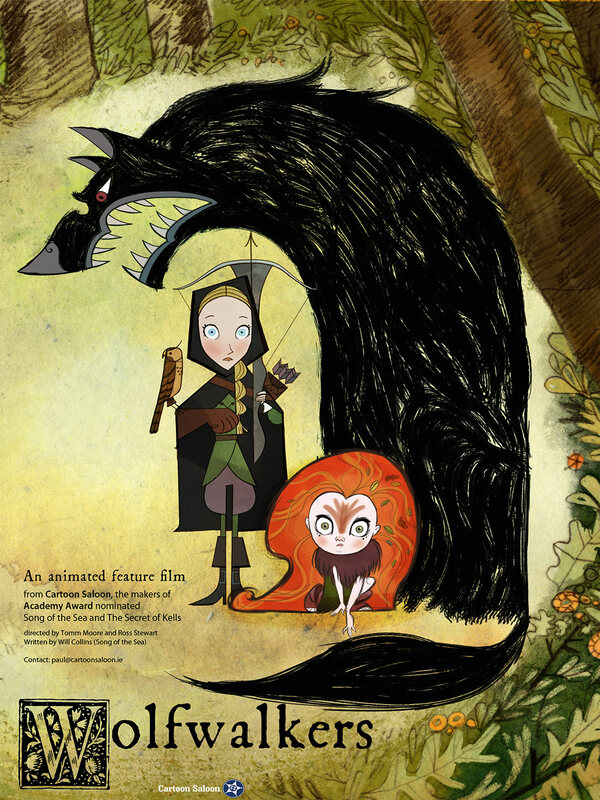 Blind Vaysha, a short film with all the earmarks of a folktale, though it is based on a relatively new story, was nominated for the 2017 Academy Award® for Best Animated Short Film. 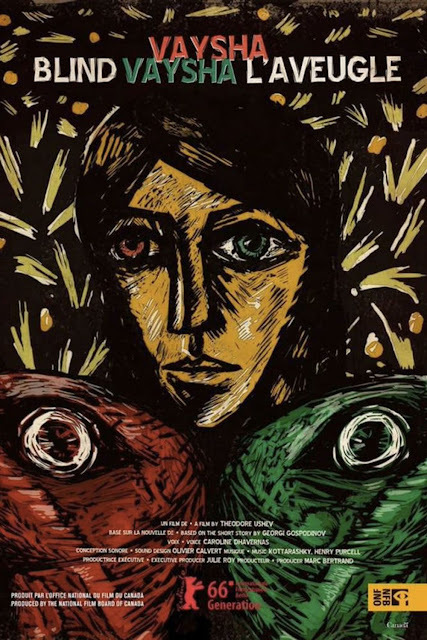 It was recently made available for everyone to watch online in it's entirety and, as intriguing as the trailer was, when the whole is viewed, it's easy to see why this nabbed a nomination. 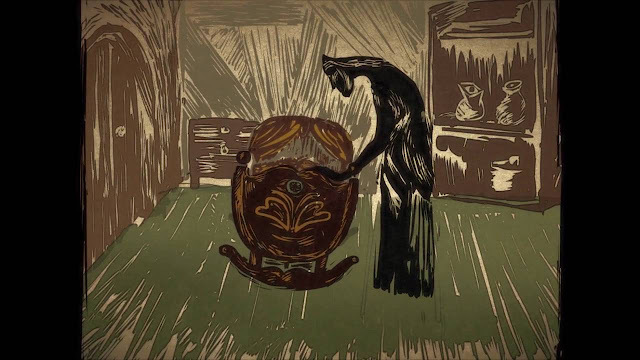 Using the linocut style, a printmaking variant of woodcut that he has specialized in since age 12, Ushev animated the entire short himself, creating somewhere between 12k-13k drawings. With a unique algorithm at hand, Ushev completed Blind Vaysha in a record six months. “You don’t animate characters – you animate the colors,” Ushev said. After separately animating each color and digitally printing, his algorithm superimposed the layers, creating a distinct, hand-printed look. As it kept the colors moving constantly, the algorithm made each frame a unique work of art. 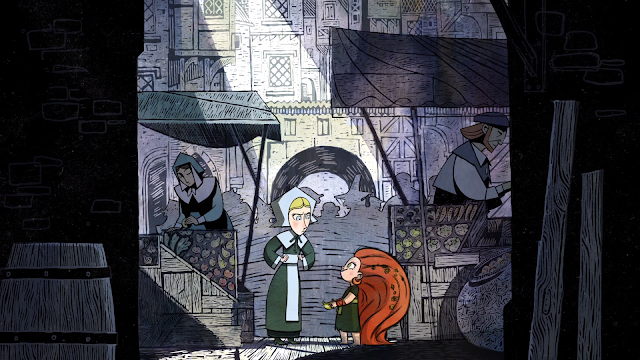 The style feels and looks like classic European folk tales, achieving an aesthetic that is both familiar and unusual. In cooperation with what could be considered a dark theme for an animated film, the short mirrors much of the anxiety we feel in today’s world and grants the audience a chance to really interpret the film themselves with a sort of interactive ending. 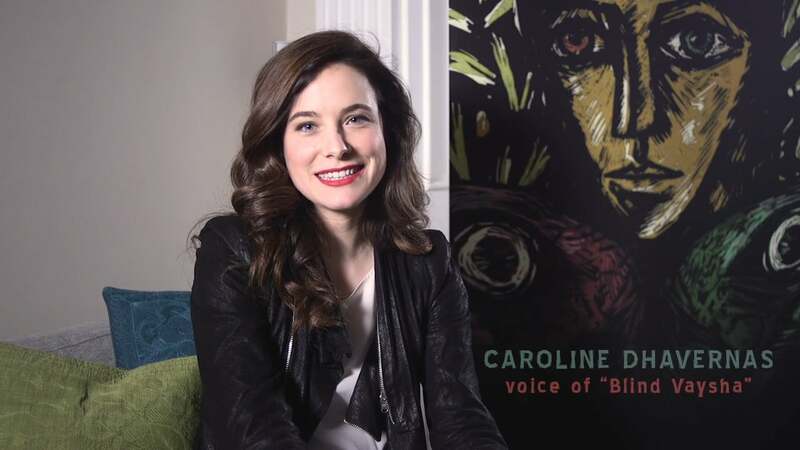 Canadian actress, Caroline Dhavernas (Wonderfalls, Dr. Alana Bloom in Hannibal) narrates the tale beautifully (both in the French and English versions), as if telling the tale to children, which is the perfect tone, ultimately leaving the viewer with questions - as intended. This little film will likely come up again in the near future however: it's rumored that it's now being developed and adapted into a virtual reality (VR) work. We can only imagine how much of an impression this tale will make in that medium! Nice to see the series dealing with the (some of) the reality that you can't wish away your previous life and bad care givers (understatement!). 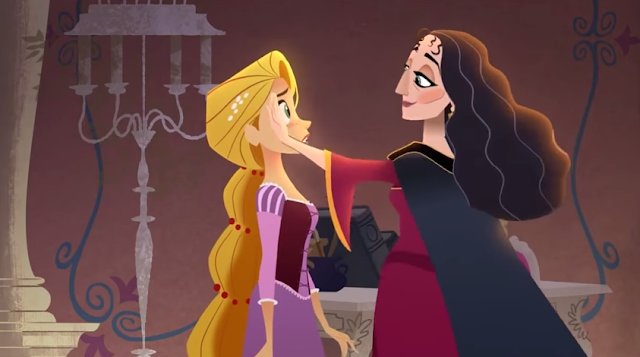 We know it's been a huge wish of folks who've identified with Rapunzel, to see that her experience of being raised by Gothel, wouldn't get conveniently swept under the rug. Getting you 'happily ever after' doesn't erase the trauma of a horrible upbringing and at some point, it has to be dealt with - more than likely continuously over a lifetime. While we don't know how this is ultimately handled, or if this is an issue that will recur/be touched on over time, we're glad to see there is an attempt at addressing this enormous issue in the first place. See the official clip, with proper resolution on YouTube HERE. 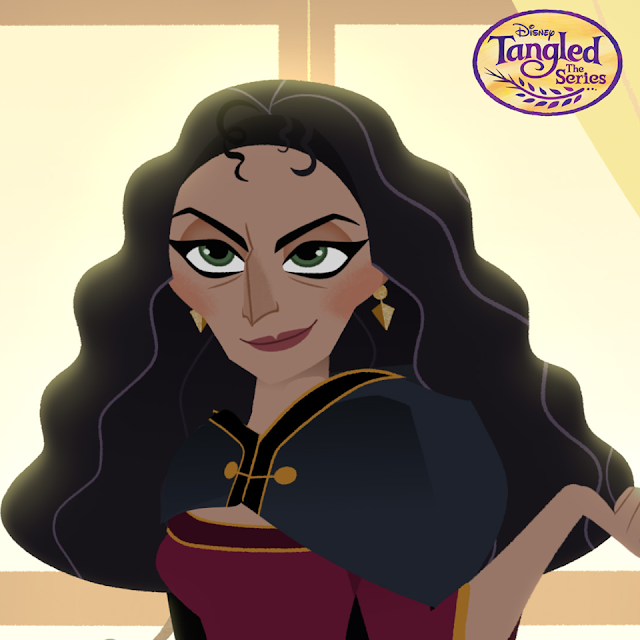 We particularly like how there's indication of a headache and mental strain, that is, turmoil from inside Rapunzel (as opposed to her getting zapped from the outside, as if your bad-parent is only an external problem), not to mention the physically manifest messy aftermath of this encounter. We know there are more than a few folks who will appreciate the not-so-subtle symbolism and will feel validated that even though that problem-person is (possibly) in the past, it doesn't mean you've completely escaped your internal prisons. The episode aired last week (March 24th we believe) so there's a good chance it will repeat again this week for those wanting to catch up. Kudos to the Tangled: The Series team for addressing this important issue! Note: For some reason, the embedding function has been disabled on the original clip, which is unusual so the one above is (obviously) someone's at-home recording of the sequence. If you can't see the one embedded above, you can watch the official clip on YouTube HERE. Back by popular demand, this acclaimed production by Dallas Children's Theater is touring the US until May 2017, as well as a couple of shows back in Dallas in July. 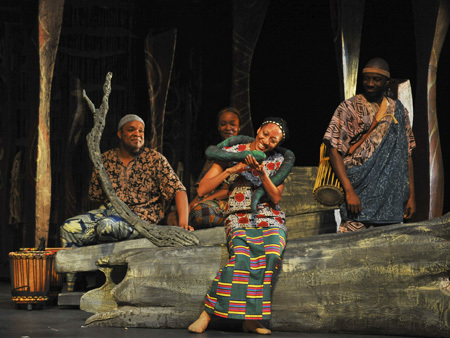 Lively, colorful and wonderfully entertaining this 'Zimbabwe Cinderella Story', originally a Caldecott winning book, (made even more popular through Reading Rainbow) and adapted for the stage a few years ago, continues to get enthusiastic reviews. We wish we had the opportunity to go to this! After phenomenally successful tours in the 2008-09 & 2011-12 seasons that visited well over 60 cities, Dallas Children’s Theater proudly presents its original musical adaptation of John Steptoe’s, MUFARO’S BEAUTIFUL DAUGHTERS ~ AN AFRICAN TALE. This gorgeous Caldecott Award winning Cinderella tale will be touring coast-to-coast throughout the United States from September 2016 through May 2017. 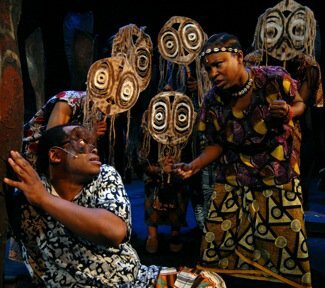 A favorite among children and adults, this African story from Zimbabwe was inspired by a folktale collected by G.M. Theal, and published in 1895 in his book, “Kaffir Folktales”. Award winning children’s author/illustrator John Steptoe had always focused on the African American experience in his work, but MUFARO’S BEAUTIFUL DAUGHTERS required him to research African history and culture for the first time. His book was published in 1987, and was acknowledged by reviewers and critics as a breakthrough because it inspires African American children to respect their ancestral origins. Mr. Steptoe hoped that his books would help all young people to take pride in who they are. Every culture has its rendition of the Cinderella story, but this one’s notion of “beauty” is more than skin deep. Mufaro’s pride and joy, two daughters named Nyasha and Manyara, have very different dispositions. The names of the characters are from the Shona language: Mufaro (moo- FAR-oh) means “happy man”, Nyasha (nee-AH-sha) means “mercy” and Manyara (mahn-YARah) means “ashamed”. Nyasha, the Cinderella character, is beautiful on the inside and out. 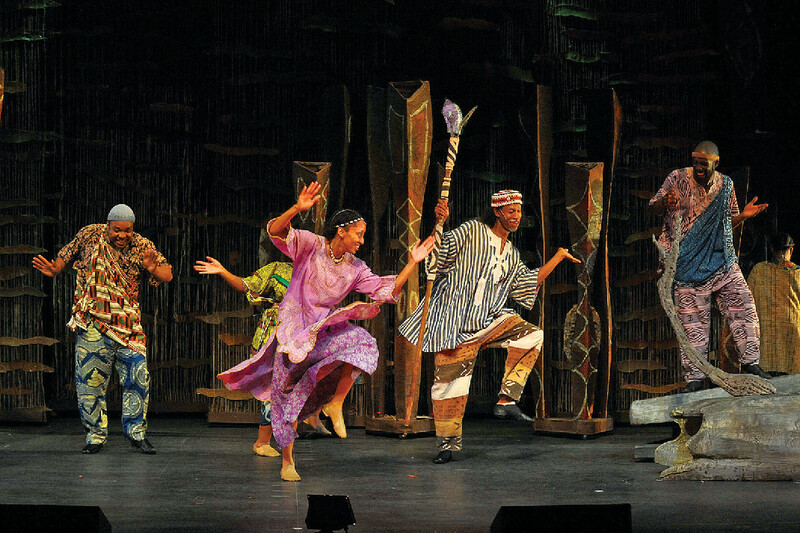 With energy and color the story is told through clear narration, African dance, drumming and song, as well as a splash of audience participation. 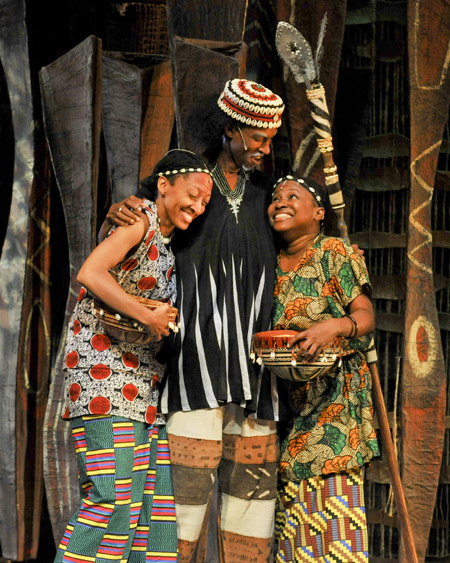 Playwright Karen Abbot Mufaro, a dignified and caring African villager, has two beautiful daughters. When he leaves for the hunt and the sisters are alone, Manyara is always angry, while Nyasha is positive and kind. Chenzira, a messenger, brings word that the Great King is inviting all of the “Most Worthy and Beautiful Daughters in the Land to appear before him” so that he might choose his Queen. 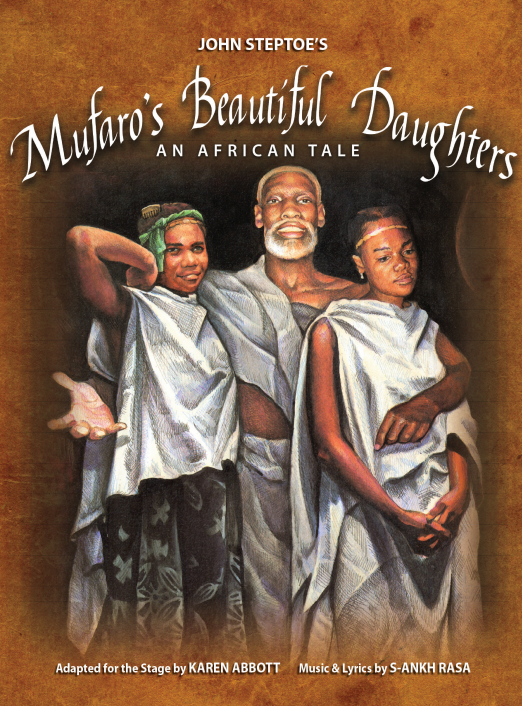 Mufaro is very pleased that both of his daughters should be selected and agrees to accompany them at sunrise. That night, Manyara, believing herself better and prettier than her sister, sets out alone so that she can be presented to the king first. 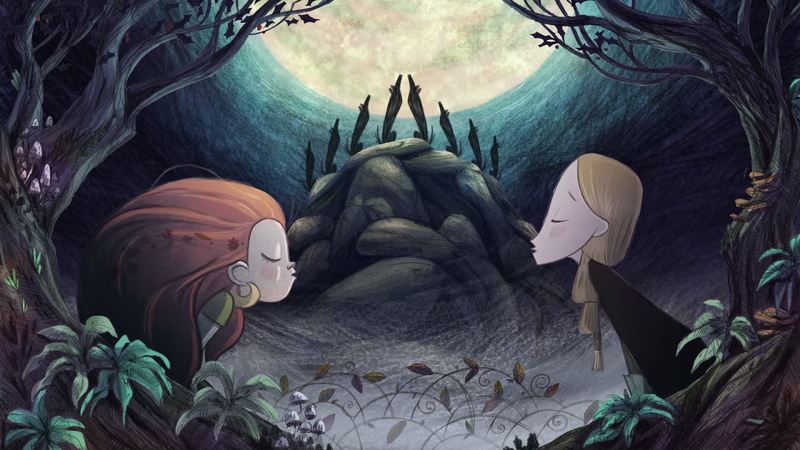 What will happen to each girl as she responds to hooting owls, enchanted trees laughing and the other strange beings she encounters along the way? 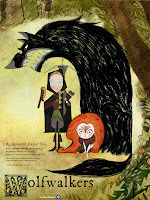 DCT’s Executive Artistic Director and director of the play, Robyn Flatt reunites the same dynamic artistic team to once again bring the enchanting folktale to vibrant life. Scenic Designer Randel Wright re-imagines an abstract African terrain where sculpted spirit poles glide across the stage to transform the setting from an open space to a lush forest. Barbara Cox continues as Costume Designer adding new flare to the already colorful African garb. Combining authentic African drums and Kora (harp), S-Ankh Rasa’s compelling original score, lifts the story to exhilarating musical heights. Pulling all the artistic elements together with majesty and grace is the classic yet modern choreography by Michelle Gibson. Don’t miss the splendor and energy of the stunning Zimbabwe region. With traditional African song, dance and drumming, come celebrate a rich and colorful culture along with goodness, generosity and love! Most enjoyed by ages five through adult or grades K through six. Here's a promotional video from the 2011 season, to give you a taste of the show. It looks wonderful! Check HERE to get more information on which cities they're visiting and when. We didn't get to promote this in time for its run, which ended on Saturday March 25th, but wanted to quickly highlight it anyway to put it on your radar for the future. Created by Limerick puppeteer Emma Fisher, who also writes and designs, as well as performs with the puppets, this show is definitely a more adult inclined take on Pinocchio, which sounds like it has parallels with The Girl Without Hands as well. (Emma's previous show, 'Spun', considered 'notable' and 'impressive', was kid and family friendly.) Shown at the Lime Tree Theater, by Beyond the Bark, in Ireland this past week., we hope there will be future opportunities for folks to catch this one. A puppet girl struggling with her disabled part splits herself in two, casts off her disabled part and banishes it to the room of forgotten limbs. 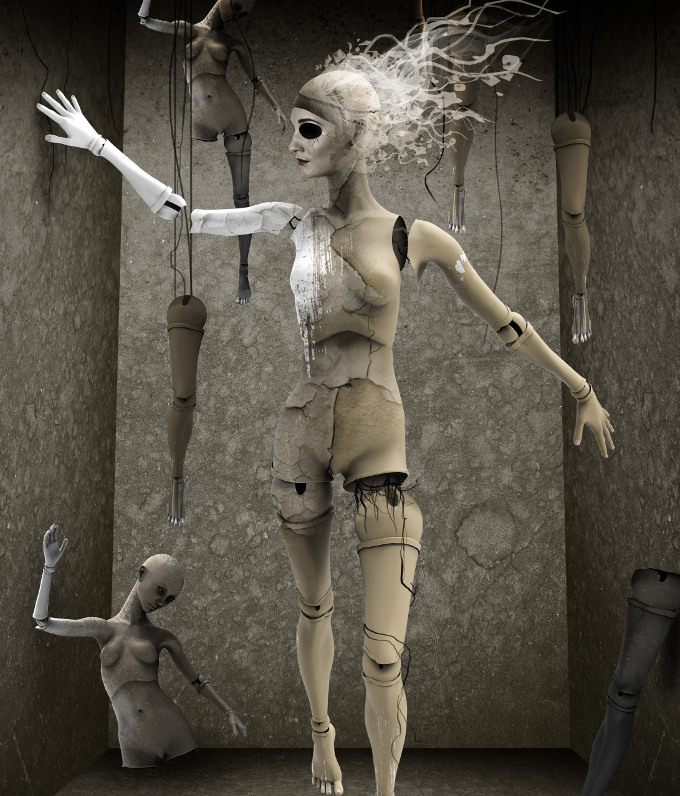 A puppet boy falls from normality, breaking and reforming. 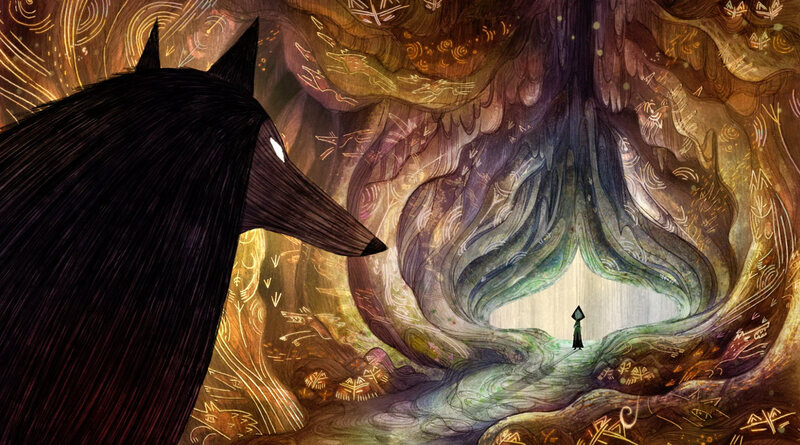 They both go on separate quests to find a sense of wholeness. 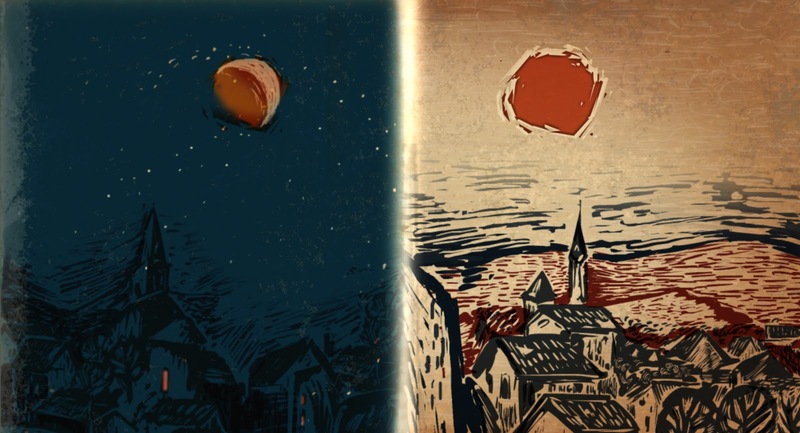 As they navigate a dark world they encounter many characters on their way- a wise bug, fragmented and broken bodies, singing mouths in jars, and silence. 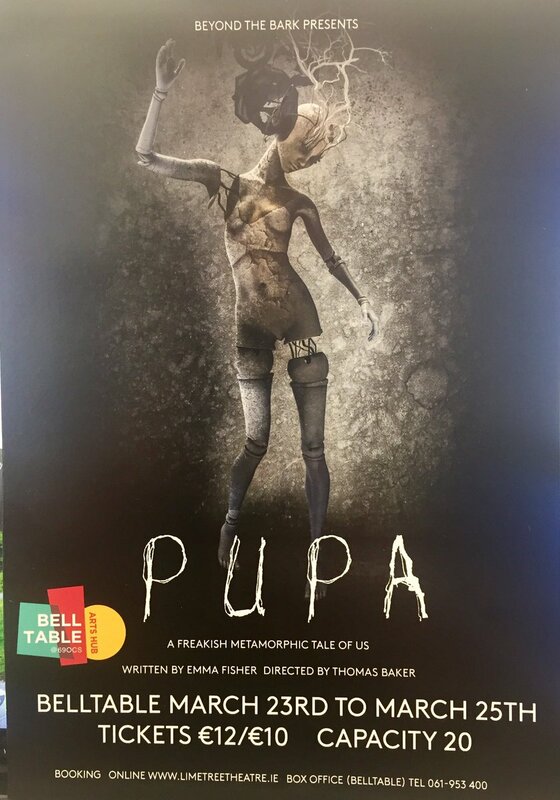 Pupa is inspired by the fairy-tale Pinocchio. 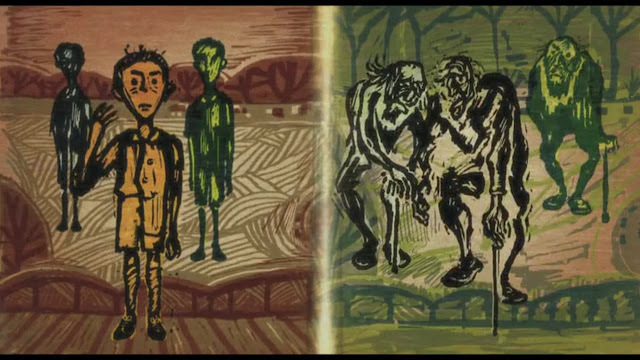 Transforming and metamorphosing from abled to disabled, such as when he burns his legs of at the fire, along the way Pinocchio is helped by many characters who share their stories with him and make him who he is. Pupa derives from the Latin for puppet meaning girl or doll, and is also used to describe the middle stage of an insect’s metamorphosis before it re-emergens as a new creature. This is a metaphor for the transition from able to disabled within the play. In a land where we are all different, we question what normal even means, looking at how people with disabilities think society sees them. We are telling stories of coming out/identifying as disabled and navigating the grey area between disabled and abled. A cool tie-in to note, Beyond the Bark hosted a special puppet-making workshop during the preparation for this show with world renowned puppet and prosthetic hand maker, Ivan Owen, along with creator and Artistic Director Emma Fisher. IVAN OWEN:Makerspace Lab Manager at the University of Washington, Bothell & an interdisciplinary artist exploring a wide range of topics. Co-inventor of the first open-source 3D printable hand prosthesis & a volunteer for the e-NABLE open prosthetics community. His past work has included musical composition, metal casting, jewelry, recreations of medieval armor and costume and prop making for stage and screen including Modern Family and Outrageous Acts of Science. His most recent project has been working with Emma Fischer to create a functional, wearable mechanical artistic creation & with her exploring ways in which digital fabrication can be utilized in puppetry. Keep an eye out for these folks and their work! We have a feeling we'll see more adapted fairy tales in the future from these people. Disney themselves are participating in encouraging this as well, which makes it even better. Some of their publications are focused on 'what you can read' if you want to read like Belle, or mining the earliest written forms of Beauty and the Beast (Villeneuve and Beamont) and republishing in various ways, not to mention emphasizing storytelling and eco-conscious creation through fashion and foot ware. The best of the initiatives we've seen to date, however, is likely a writing and filmmaking collaboration with non-profit group, Young Storytellers, who aim to give a voice to low-income students by helping them write their own stories, through a one-on-one mentorship, and see them brought to life on stage and screen. 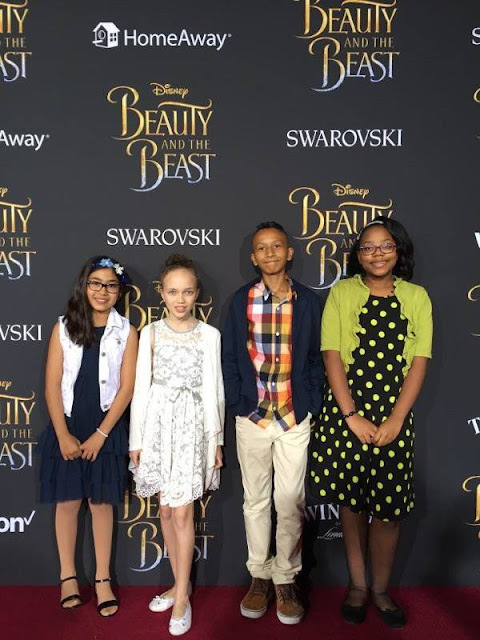 The title of the project was 'Beyond the Castle: Stories Inspired by Disney's Beauty and the Beast'. Four talented young people were chosen to have their stories made into short films. Here are three of them (we can't find Acacia's story and film, Cooking Catastrophe but have no doubt it's just as wonderful as the others and hope it will be available on the Young Storytellers' YouTube Channel to see soon!). 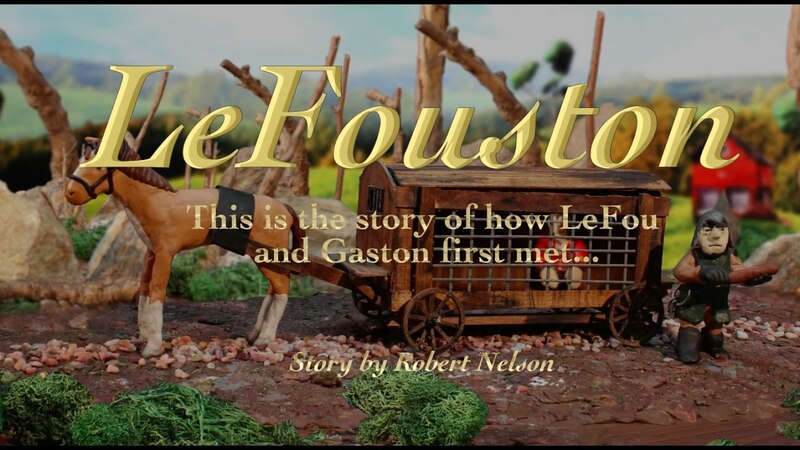 This one is by 12 year old, Robert Nelson, who imagined how Gaston and LeFou might have met. “LeFouston” from “Beyond the Castle: Stories Inspired by Disney’s ‘Beauty and the Beast’"
The video was created in stop motion by Tongal creator Kevin Ulrich, with music by Trevor Gomes. "Pug in a Cup" from “Beyond the Castle: Stories Inspired by Disney's Beauty and the Beast"
Written by Hana Morshedi (age unknown) and directed by Tucker Barrie. “Beauty and the Curse” from “Beyond the Castle: Stories Inspired by Disney’s ‘Beauty and the Beast’"
Written by Tamara Sims (based on her short story “Changing Ways”, age unknown) and directed by Maya Rudolph. Many congrats to Tamara, Robert, Acacia, and Hana! 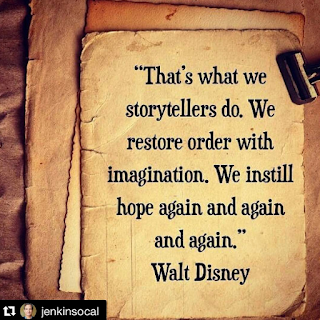 A brilliant and successful collaboration thanks in large part to the ongoing amazing work by Young Storytellers, along with Tongal and Disney. We only wish more kids got an opportunity like this, or are being encouraged to do this themselves with their own resources. You can find out more about Young Storytellers and how to help with wonderful programs like this, by clicking the link HERE. We knew it had to happen eventually but feel it's worth mentioning and yes, celebrating, as it goes into its final couple of episodes this week and next. 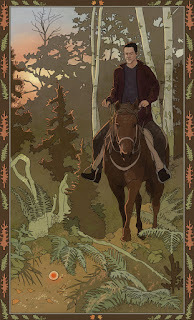 This dark fantasy procedural was a landmark show in bringing fairy tales and folklore back to the mainstream public and has been doing so for six seasons* (though props should also go to Supernatural, who have been maintaining their following and are currently in their twelfth season, albeit it to a less mainstream audience). NBC's Grimm began the dark fairy tale-meets-procedural with a 'monster of the week' type approach, in October of 2011. 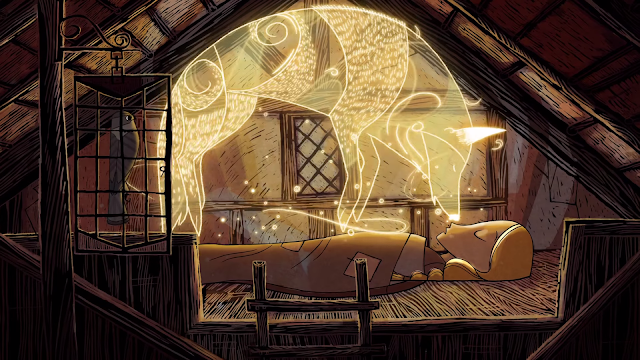 There was effort right from the pilot to show fairy tales in a different light and use the tropes in different ways, with a lot of folklore mixed in. That eventually evolved into its own show, hastily evolving past the teething troubles where it had a tendency to have damsels in distress to being more empowering for everyone, surprising more than a few executives and critics, earning it the title of 'the little show that could'. 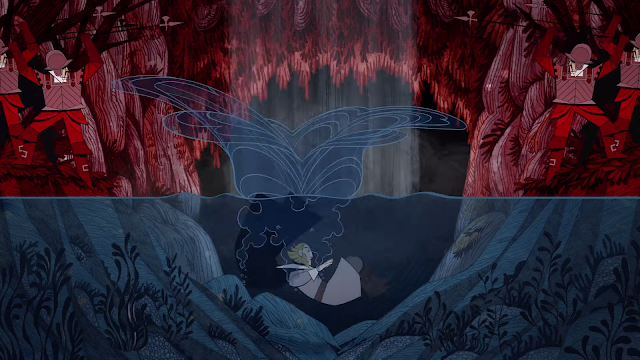 One of the most fun aspects for folklore and fairy tale folk has been the use of quotes from tales and classic texts which, when followed (and the source figured out), provide huge clues as to the themes and underlying details included in that week's episode. More than a few lesser known tales were mined for quotes as well as some quite obscure ones, which was wonderfully refreshing to see too. Some episodes have been more successful than others but when the show began to truly build its own mythology, and 'Scooby gang', working in tales and folklore along the way, that the series built a strong and loyal following. 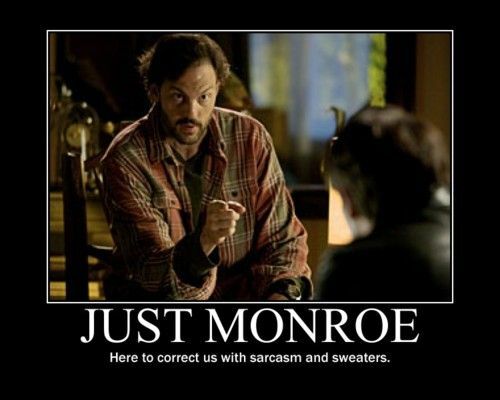 (Click HERE for a list of characters, including Wesen types, that have been introduced throughout the series to date - scroll down for the creature list and their episodes.) 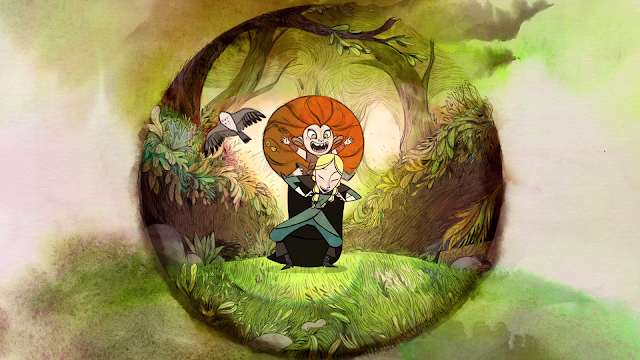 The show is currently in it's sixth, and last, season and though it can be recognized as being the same show, the season arcs have changed the feel of the show quite substantially so episodic stories aren't used as often, so much as exploring how a piece of folklore (or creature) might be at home in this universe where people are often more than they seem. Humans live and work alongside 'Wesen', or people who are part human and part creature (often from myth or tales). 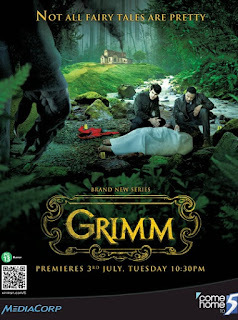 The lead character, Nick Burkhardt, is both a police detective and, as he discovers in the first few episodes, a 'Grimm', a human of supernatural abilities who are traditionally 'reapers of Wesen' (read, hunters and exterminators). 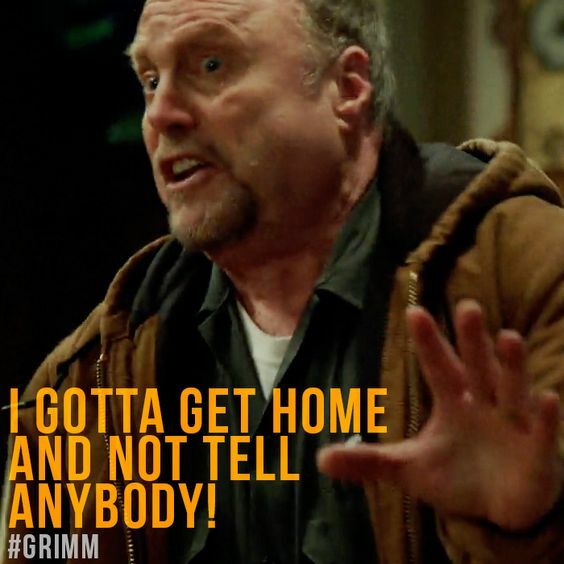 Our Grimm, however, seeks to find common ground between Wesen and humans and the series follows his journey as he does this (and investigates weird, and largely Wesen crimes), with varying amounts of success. 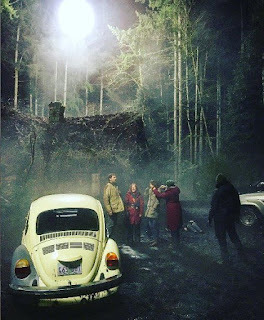 His 'Scooby gang' expands along the way with at least half of them being Wesen and the viewer, along with Nick, discovers the history, traditions and 'real' folklore along the way. 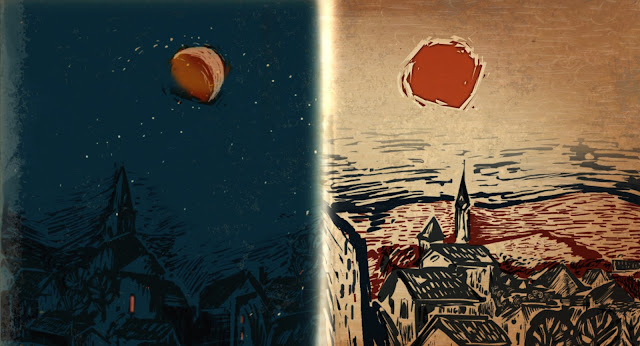 The more the seasons went on, the bigger and more involved this world got, along with ambitions, conspiracies and much more, all having a lot of fun with history, urban legends, fairy tales and lore along the way. More creatures are discovered with cultural traditions and rituals (all with interesting names that drive etymologists crazy in their inaccurate use of German and Latin!) showing the viewers how similar to humans all of them are. The show's themes and statements on inclusivity, as well as the need for cultural understanding and respect have been timely throughout the years, addressing equality (and the current remaining lack of it in surprising places), no matter the nationality or socio-economic status, as well asking the same for interracial marriages, their offspring, orientation and preferences. It's been one of the aspects that's endeared fans to the show, with the unwavering stance on acceptance and the need to build bridges when we have the power to do so, even if it's personally difficult. Not at all coincidentally, many of these same things are what attract us to fairy tales: in reading a wide variety of tales from around the world you begin to see they show both the sameness of humans across the world, while at the same time celebrating their unique cultural identities. 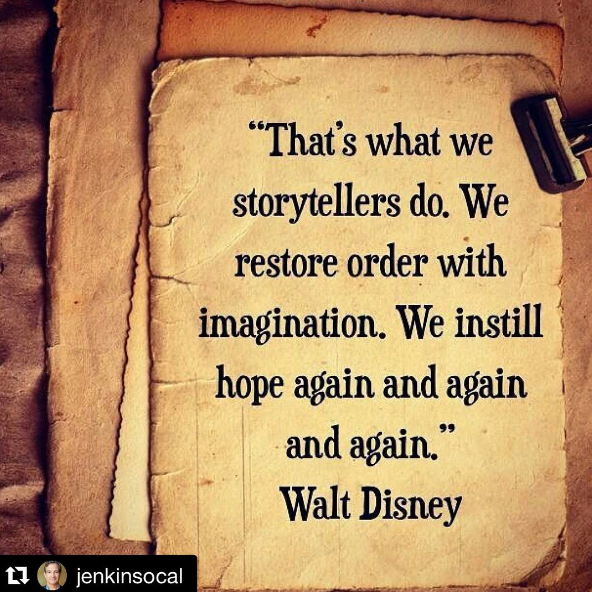 It's not difficult to see why fairy tales fit with these themes so well. 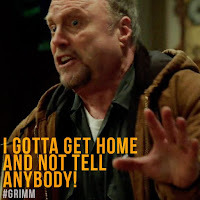 Though faithful fans have been running campaigns to get the show picked up on another network or by Netflix or Amazon to give it a new and longer life, the writers, knowing the show would be finishing, wrote this final season with a view to finish the stories. 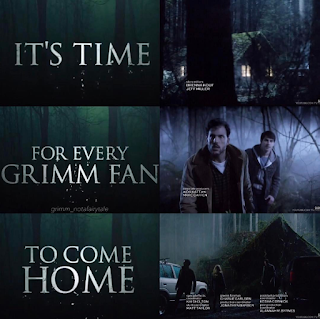 Interestingly, the episodes, rather than focusing on an apocalyptic scenario (though that potential is there), the emphasis seems to have been more on the 'intimate' aspects of the show for most of the season; the characters relationships to each other, to the town and to Wesen integration as part of normal society. The writing has been solid and satisfying, while not too flashy, making it look more stable than ever, as ratings would attest to. While you want a show to finish on solid ground and go out looking good, it's also bittersweet. 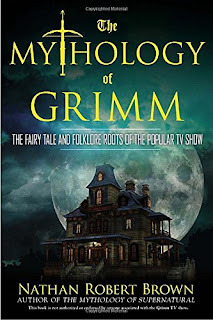 Fairy tales aren't as obviously an inspiration in this last season (though they're in there if you know where to look), but specific folklore from around the world most definitely is. 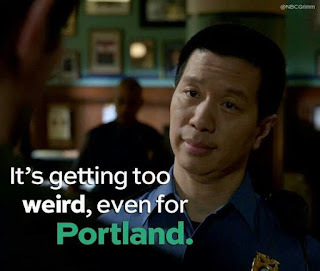 The stories, however, are told in a way that make them more about Portland and its citizens, as well as the personal journeys of the beloved Scoobies, and, in a move that's created a sophisticated departure from the original, and sometimes dismissible, 'monster-of-the-week' shows, it's only making viewers love Grimm more. Many of this season's episodes can actually be seen to be a metaphor for the show itself as it finishes, which will make for interesting re-viewings once the whole story has been told, while the tag line for these last couple of weeks is that the show is "going back to the beginning". It was at the beginning that the use of fairy tales was the most obvious (some would say heavy handed), so we're interested to see how they bookend Grimm with its developed mythology and popular characters. We presume that 'end' aspect will become more evident in the second last episode (airing this evening), as all cast and crew have confirmed that the finale of this series is clearly an 'end', and one they're reportedly happy with. Grimm certainly isn't for everyone. The horror/gore aspect is sometimes a challenge for sensitive folk and there is very little of the fairytale-typical fantasy and happily-ever-after vibe, that keeps viewers watching other shows, but there is humor, wonderful characters (especially in the Scooby circle - shout outs to #monrosalee, #drewwu, #hexenschade, #dianahoneybadger and #meisner), fun locations (the trailer, the spice shop, monroe's house, the cabin in the woods, the Portland forests) romance, tons of fairy tale 'Easter eggs', wonderful one-liners, mystery and overall a lot of fun playing with tropes, history and folklore, not to mention every now and then it hits you with something very important. 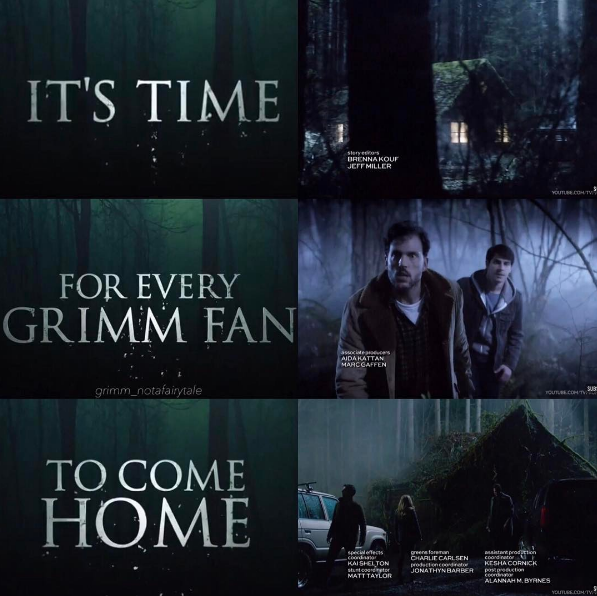 We're going to miss checking in to see what's been developing in the Grimm universe and we'll make it a point to be watching as it says goodnight. 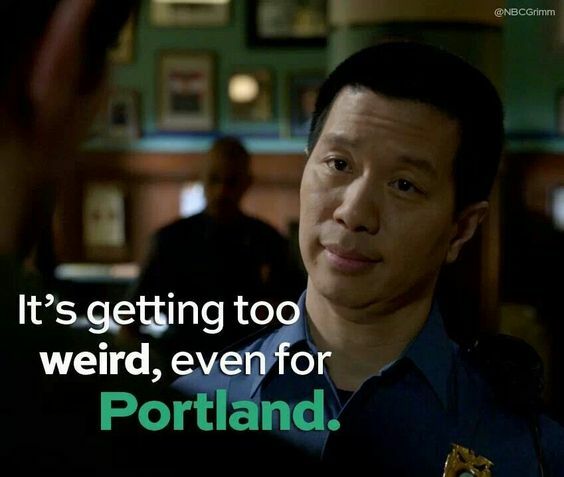 PS Here's some adorably-wonderful advice to baby Kelly, (Nick and Adalind's half-Grimm-half-Wesen son) on the need to step up as the show closes. * For comparison, Buffy the Vampire Slayer ran seven season, with a break after the sixth when it finished, then was renewed on another network, giving it one unexpected last season to wrap the multiple story lines. 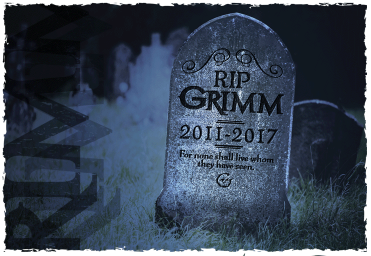 ABC's Once Upon A Time, which began around the same time as Grimm, and is also in its sixth season, has rumors about this being the last one as well, though that is unconfirmed. 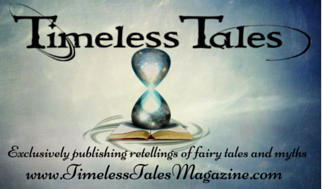 Enchanted objects are one of those fairy tale elements many people love. 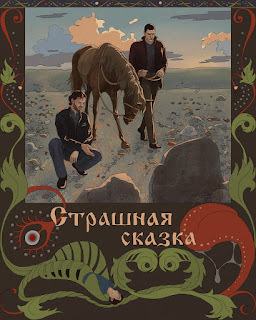 (We posted on the appeal some time ago HERE.) When Disney's 1991 Beauty and the Beast chose to have visible enchanted servants, instead of the traditional invisible ones, people were thoroughly, well, enchanted. Everywhere people wished their own household objects would come to life and help them with their own life conundrums. 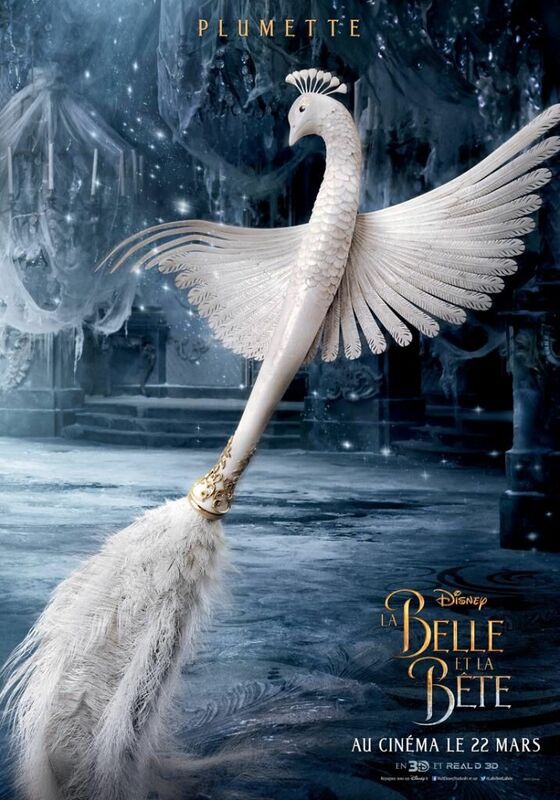 It really wasn't until the live action remake's "first looks" pics appeared on the internet, that people processed just how frightening a real enchanted object could be. For the entire nostalgia crowd, most of whom adored the animated talking objects (and preferred their object form to human form, if they admitted it) seeing the direction the live update was heading in via pics released on the internet, was a wake-up call: one, that some things should not, perhaps, be transformed from animation to 'real', and two, that having (truly) sentient furniture and accessories (and homes) in real life could actually be a pretty creepy notion. 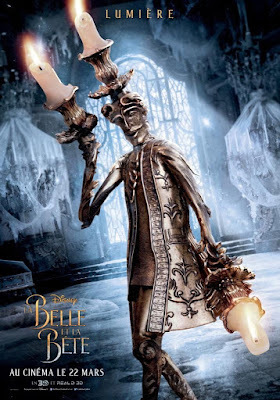 It turned out to be one of the biggest challenges of the creative team: to produce believably real enchanted objects that still appealed to audiences, instead of horrifying them. 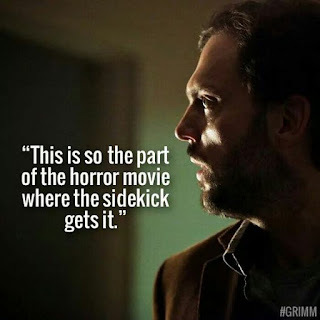 Even with a lot of effort and (eventually) enthusiastic responses from audiences to the trailers showing the results, one of the most consistent negative comments we've heard from enthusiasts and critics alike (including the exiting audience when we saw the film) is how sinister they felt the enchanted objects were throughout the movie. There was additional dialogue from the enchanted servants in the film, which added to this impression, but in the new movie, it was pretty clear the household were very personally motivated (ie. 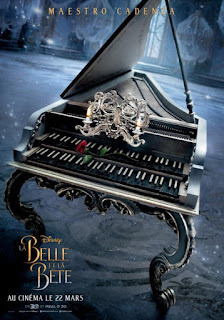 had their own agenda) to keep Belle in the castle, and prevented her from leaving multiple times, when a truly friendly object would have done the opposite. 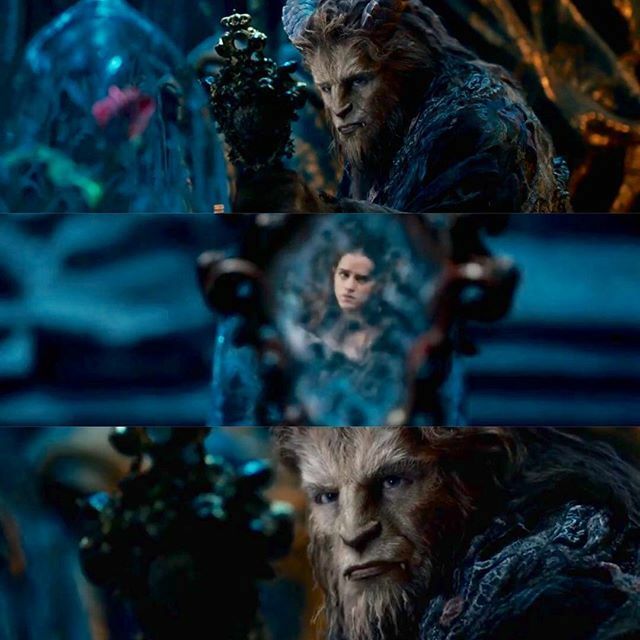 In fact, toward the end, there was quite a divide between the feelings the Beast had for Belle and the servants. It was only out of respect (and possibly love) for their Master, that the objects accepted the Beast releasing Belle to go see her father. Household objects preventing you from leaving - something Belle managed to narrowly outwit at one point, thanks to taking advantage of an oversized 'doggie door' - is pretty chilling. There is a whole line of questions and story issues behind this drift to the dark side but dubious motivations, and turns of cute Disney sidekicks to the sinister aside, there's another aspect to this storyline that's pertinent to our modern world. The idea that angry household objects could take revenge, and/ or protect their turf, from intruders or visitors, is frightening. 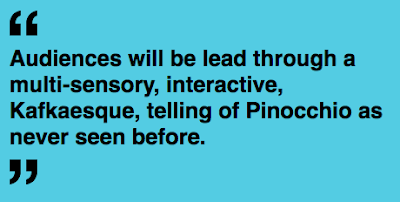 And suddenly our Smart Homes and devices come into sharp focus. That’s not to say that things are all bad. Honestly, these are some great smart devices. They anticipate the needs of human/Beastly occupants perfectly. Mrs. Potts offers tea; Lumière dims the lights just at the right moments, while somehow escaping the incessant firmware upgrades that plague our real-world smart lights. 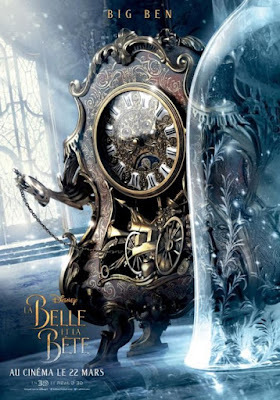 They offer sound advice: When the Beast asks Cogsworth how he would know if he’s in love with Belle, Cogsworth responds by saying “You’ll feel slightly nauseous.” Would an Amazon Echo give it to you straight like that? Doubtful. 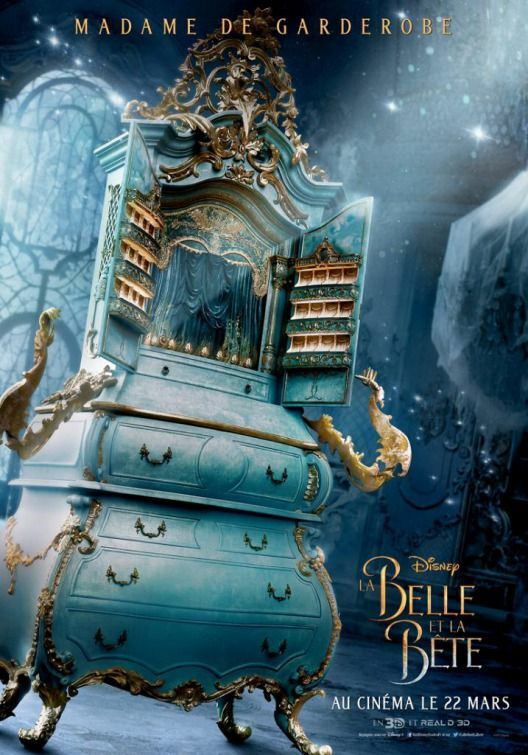 ... perhaps most importantly, the smart devices exhibit actual forethought, tweaking Belle’s environment to make her comfortable despite the Beast’s humbuggery—which ultimately creates the conditions for romance. Twenty-six years ago, all this animated meddling was adorable. (When a teapot sounds like Angela Lansbury, it does what it wants.) 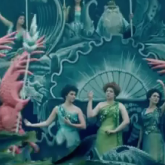 With the advent of CGI, though, the Beast’s castle seems to have relocated to be closer to the Uncanny Valley. 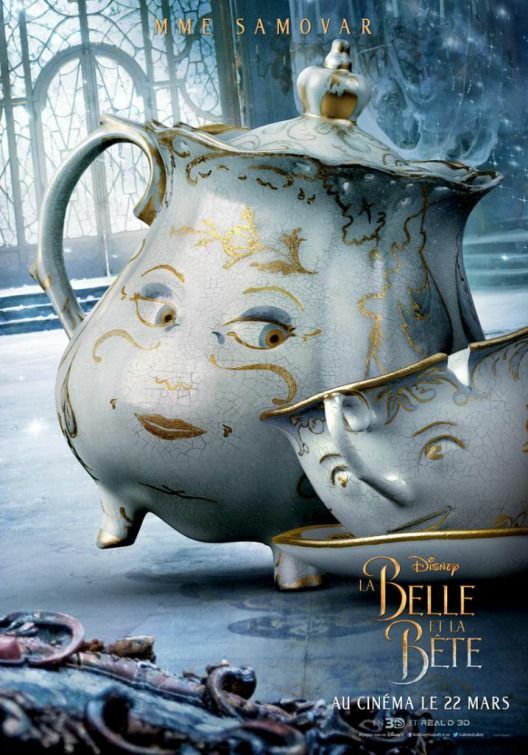 Mrs. Potts looks like something you could pick up at an antique shop; Lumiere’s candles seem really to ignite. And in a time when connected devices can bicker and develop relationships, the repartee among the staff starts to feel less like a workplace sitcom and more like a dystopian sci-fi novel. As science barrels toward creating true 'AI' (artificial intelligence) at the same time as smart devices become more and more integrated into our daily lives, work and homes, the sinister scenario of S.A.R.A.H. (Self Actuated Residential Automated Habitat) becomes more and more possible. People inevitably, to an extent, get attached to machines they use regularly anyway (cars, boats etc). The drive for humans to connect, even to non-humans, is very strong, but there's an even deeper dynamic with smart devices - the devices which hold your information, passwords, preferences, memories, secrets and even hopes and dreams. Not only do people get attached, they become dependent, letting their guard down around their devices, making themselves vulnerable to losing regular skills (like navigating streets) but particularly to being taken advantage of by the invisible puppeteers behind the programs. No, we're not in the age of AI devices (yet), but there is intelligence and motive, behind every one of the devices and apps we use - even if they're benign and/ or perceived as 'good' - and we would be less vulnerable if we remembered that. The responsibility is still ours. When we are taken advantage of it can't be blamed on the machine. It's 'user error'. Literally. ... while it’s tempting to blame the IoT (Internet of Teapots) for the bloodthirsty townspeople, or for the Beast’s fate soon thereafter, the true culprit isn’t the smart home... Only when the Beast falls in love with Belle does he breach his own best security practices, giving her the mirror that ultimately proves his downfall. A reminder to all who share their passcodes and devices: Love can make us hasty with our information. And that information—or misinformation—can do IRL harm. Don't let the real invisible servants take advantage of you every day. Be smart with what you write, click and share. Protect your freedom. Be the user, not the used. Note: We recently attended a special introduction to coding for kids, and it opened with a short video explanation of the importance of being able to use and/ or understand code, which boiled down to: "program or be programmed. "If you don't know what the software* you're using is for, you're not using it, but being used by it." The 2 minute introduction explains how to not be scared - or be taken advantage of - but how to be aware of how the internet and software on smart devices is used, so we can have a choice about it. You can view it HERE. Wonderful news! If you missed the pitch trailer released very recently and are wondering what this film is about, you can catch up HERE. 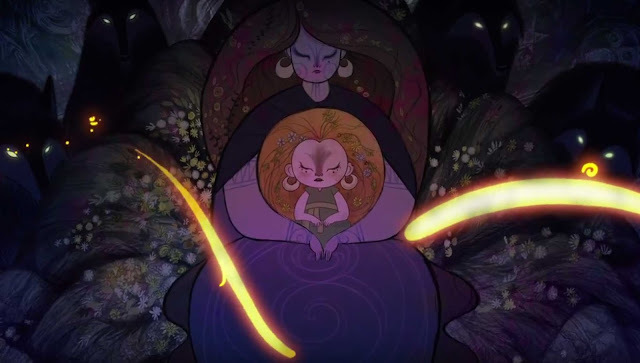 This film harks back to the gorgeous stylings of both Secret of Kells and Song of the Sea, but adds it's own elements and visual language too. (Co-directors) Moore and Stewart have spent time developing a graphic language that reinforces the themes and values of their story through the visual design of the film. As seen in scenes from the trailer, the Puritans and English army are rendered in an ascetic woodblock style, while the wolfwalkers and wolves exhibit a freer, more expressive line style. Tomm Moore, part owner of Cartoon Saloon and director of Secret of Kells and Song of the Sea, along with one of the animated short films within The Prophet, has as strong commitment to hand drawn animation, and though, he's open to using technology to enhance production, hand drawn animation will be the medium for this film too. 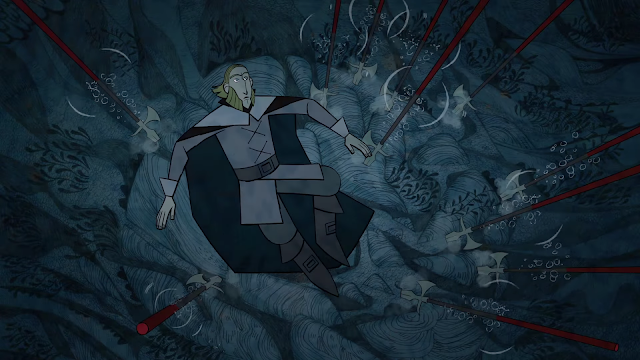 Being willing and able to develop a human-driven graphic style that can adapt to the storytelling and characters guarantees a unique look and feel, part of which is 'the human connection behind the pencil', something which audiences today are responding to as strongly as ever. We know we have a while to wait yet but we'll keep you posted on developments are they happen. We're really looking forward to this one!